I was up in Ely this weekend. 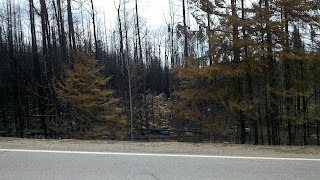 The fire from a week ago has scarred the south side of Ely on Hwy 1. 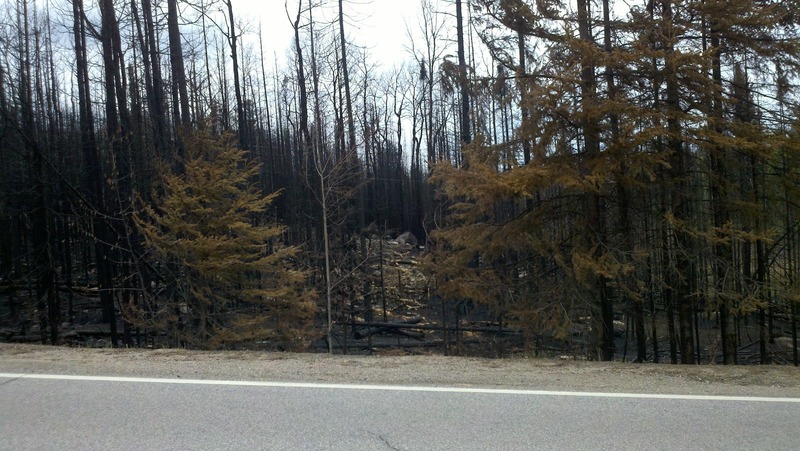 You can see several homes that were surrounded by burnt trees that were saved by firefighters. Already the green has been returning. Usually after a fire, some of the first flowers to emerge is fireweed. Fireweed produces some of the lightest honey in the world. The hot humid weather makes the inside of a bee hive very hot. Water collection and evaporation to cool the hive is difficult for the bees. Being the dewpoint is so high, water evaporation slows and the ability to cool the hive gets harder to do. This is part of the reason on hot days, bees will leave the interior of the hive and beard underneath the front of the bottom board or cover the front of the hive. This is not a preview of an imminent swarm, they are just hot. The added heat does brew up the reason to swarm. So we need to be vigilant in a 7 day inspection schedule looking for and removing swarm cells. There are two plants that are blooming or about to bloom. Black locust trees are about to bloom. Black locust trees grow quite tall and flower large clumps of showy flowers that will yield some very nice honey. Yellow sweet clover is blooming in ditches. This plant while a major nectar flow west of Minnesota. Never seems to give up nectar in this side of the state. Observing these two plants will tell the beekeeper if there is any nectar coming in by how much they are being worked by the bees. White Sweet Clover should be blooming soon and is a major honey plant in Minnesota. Swarming of over wintered colonies is going on still at a high rate. Beekeepers not able to divide has the hive dividing itself. This will hurt the honey collection of these colonies considerably, but sometimes life gets in the way of the bees and the beekeeper can't get there. The package bees have been building up with most beekeepers in their second box. 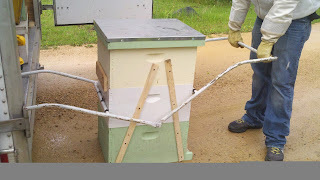 With the greater number of bees in the hive, the bees will draw foundation at a faster rate. Feeding the hives that are drawing comb is still a priority. Colonies need to be monitored for food in the hive so they don't starve. Speaking of feed. Right now there is not much blooming around Stillwater. 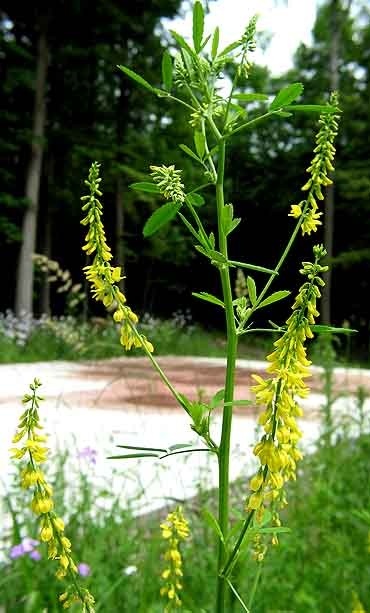 I have heard of yellow sweet clover blooming in some parts of the metro. I took my dog for a walk last night and came across some clover starting to bloom in my back food plot. Old beekeepers use to say that the main nectar flow starts ten days after the first clover bloom. It may start as a trickle or a torrent one never knows. 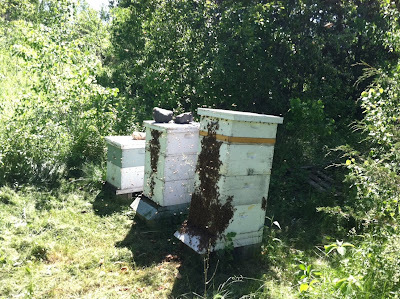 Overwintered colonies should have two empty supers on right now. Ten days can make a huge difference in hive population. If a queen has been laying 1500 eggs a day in 10 days there should be 15,000 more bees in the colony than at the present time. If the timing is right the supers may start filling up earlier than normal. So let's get the supers on. 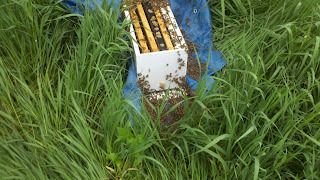 In the words of a beekeeper master"May the flow be with you"
I went through the hive that the swarm came from. I first checked the top bars and bottom bars for swarm cells. Found a few capped. I scrapped them off. I decided I wanted to check the brood for disease. I started pulling a few frames. The beekeeper had 10 frames in a couple boxes that made it tough to get the frames out. One box had 9 so that one was easy. It is a good thing I pulled frames. I found another 15 queen cells that were ripe and ready to hatch. I am sure they would have emerged in the next hour or so. I squashed all the cells. The brood looked great, all pearly white. No eggs as expected but older and capped larvae through out the 3 box hive. After the inspection I installed a new Carniolan queen that the beekeeper can release when he is back from his business trip. 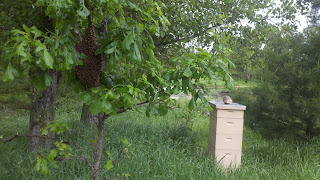 I got a call from a spouse of a beekeeper that their bees had swarmed. The beekeeper was on a business trip and has not been able to divide. So the bees did the work for him and were up in a tree. The day was rainy so they were not going anywhere. I was able to bend the tree they were in over my 5 frame nuc. 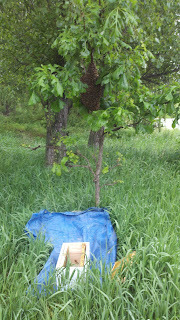 A quick shake of the tree put the bees in my box and on the tarp I had put down. Most of them were marching in the entrance when I left to go do other things. I will go to pick them up at dusk. We will be closed Memorial weekend. May 25th - May 28th. Open May 29th 5 - 7 pm. Starvation, this happened last June about a week before the nectar flow started. There was no food left in the colony and no nectar available. 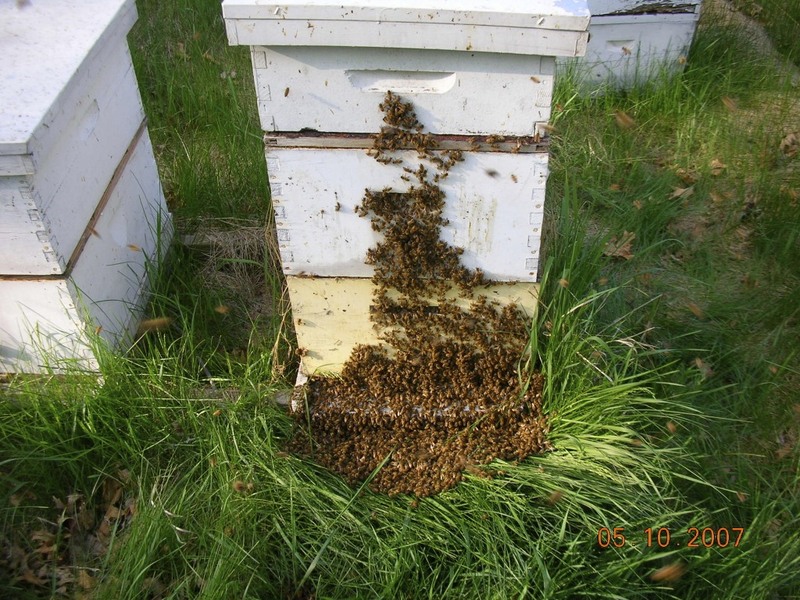 Many over wintered colonies are full of bees. With all the brood in the hive there is a demand on the honey stores. We are entering a time when there is a dearth in nectar coming in. 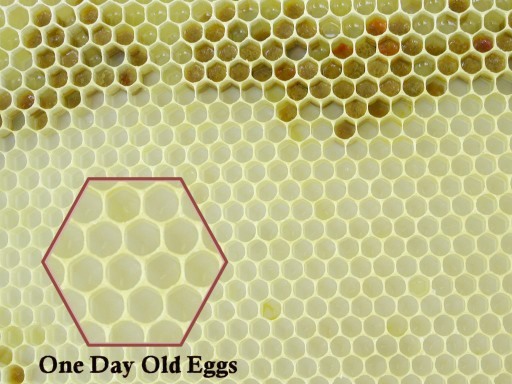 Beekeepers need to look at their colonies during their 7 - 10 day inspection intervals for swarm cells. Lifting the hives will give a good idea how the food stores are doing. 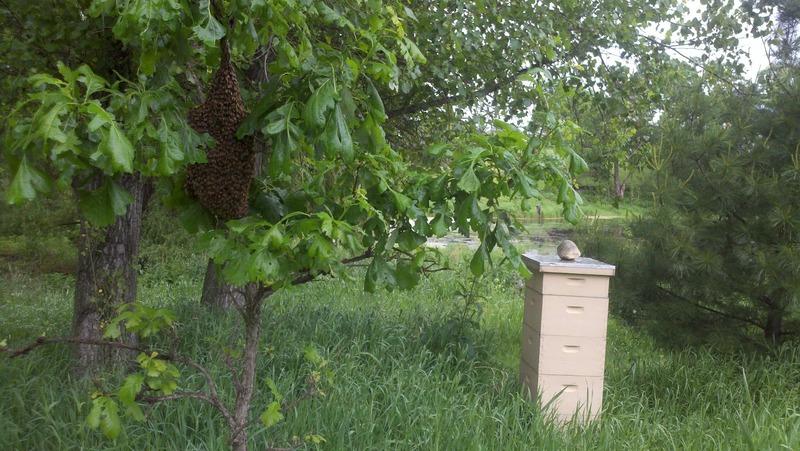 Ample honey stores will get the bees to the nectar flow which may be early this year. 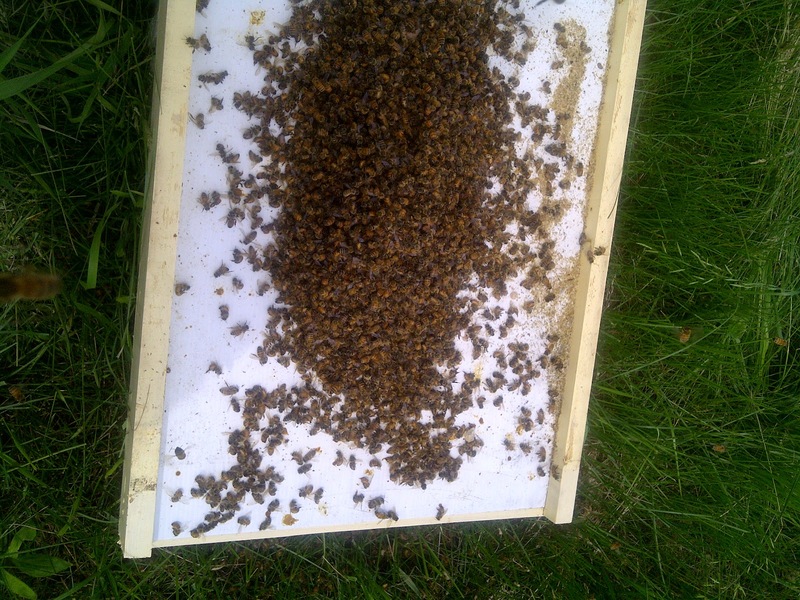 Feed if necessary for overwintered colonies on drawn comb. The packages that came on the first load are building up nicely. New brood has been emerging and I think it is time to add a second box. 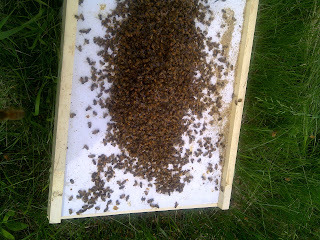 A second box is needed when the bees have 8 frames drawn or are working on finishing the 8th frame. One of the frames that the bees are working on (the outside frame with honey or pollen) is removed from the bottom box and added to the second box in the middle of the frames. The bottom box stays at 9 frames. The frame added to the second box is bait for the bees to move up. The entrance reducer is opened to the bigger opening. 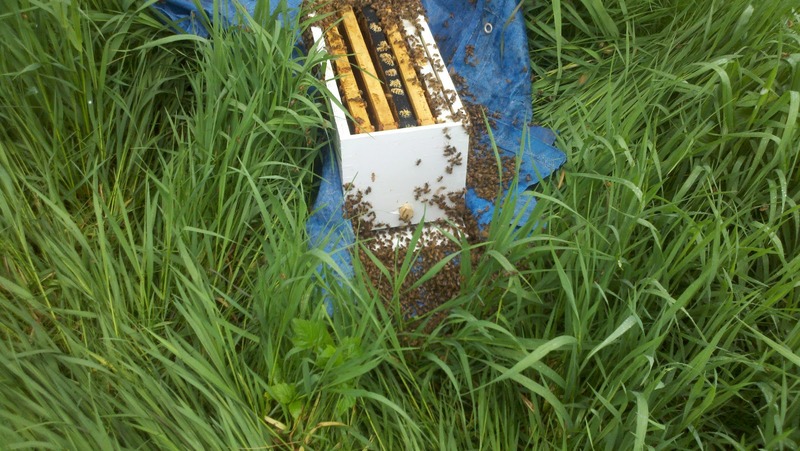 Feeding syrup is still necessary for the bees to make comb on the new frames. The bee packages that were on the second delivery should be ready for this in one week. The warm weather coming this week will be ideal for hive development. 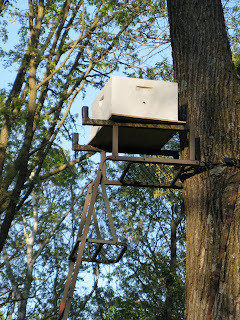 Bait hive with plywood cover and bottom. 1" hole is the entrance. Photo by John E.
Swarming is going on all over the state. 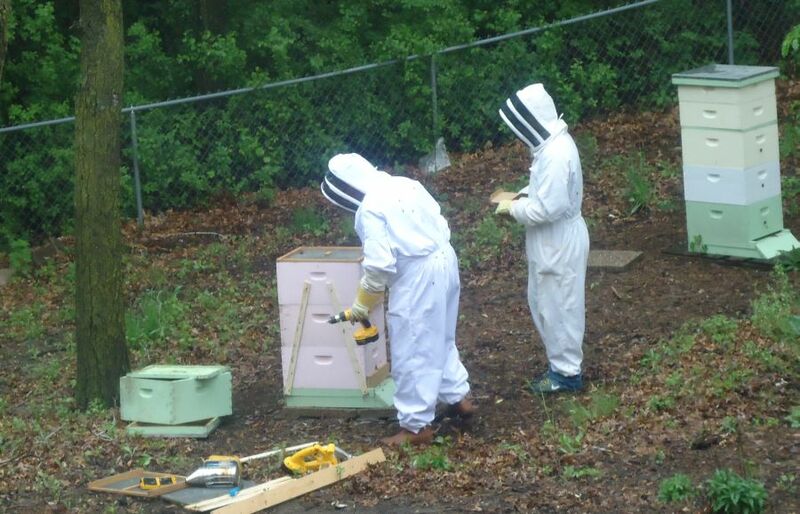 Beekeepers that have not divided their overwintered colonies are kindly donating their bees to other beekeepers. Having a bait hive in a tree is an easy way to catch one of these free hive of bees. Using a deer stand in a tree is a slick way to put up the bait hive. 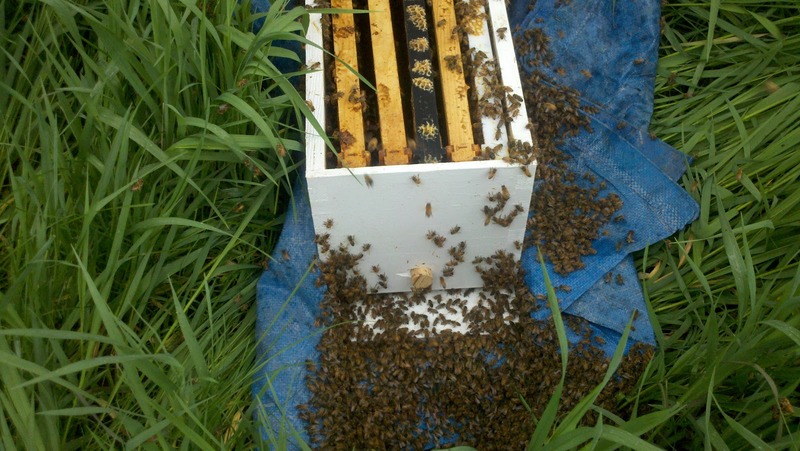 A frame of drawn comb is a good attractant to get the bees to move in. The box should be a deep. Anything smaller the bees might not move into it. The hive carrier bites into the cleats on the side of the hive. Two people can easily lift and move a three deep hive that is quite heavy. The entrance is blocked off. The wood lath is attached at an angle with screws in all the boxes and the bottom board. I moved two colonies on Sat afternoon for someone that was getting out of bees. They had both swarmed recently. The weather was cool with a slight drizzle. 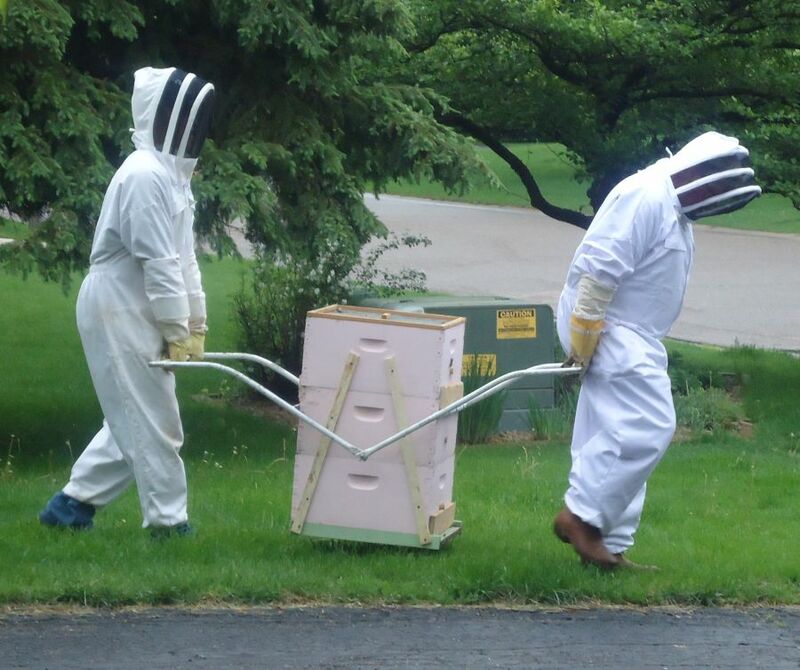 Perfect weather for moving bees. Being they had both swarmed, field bees were basically all gone so they were not a concern. I brought with me some wood lath, my cordless saw and drill, sheetrock screws, screen tops and my hive carrier. Also my bee helper, Cory. I smoked the hives and screwed down my screen top. The screen top is used to prevent overheating of the colony. I blocked the entrance with wood. If it was hotter out, I would have screened off the entrance for more air circulation. 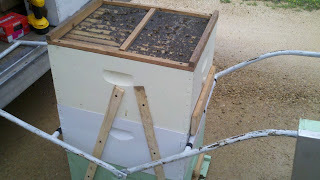 The lath was then screwed to the hive sides. Putting lath at an angle prevents any movement of boxes and bottom board. 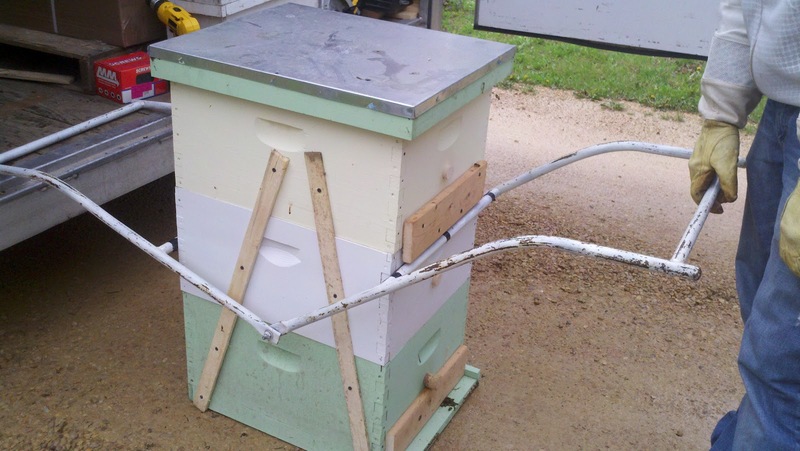 Cleats were added to the ends so the hive carrier would not slide up the side of the boxes. When done, Cory and I put the carrier on and moved it out of the backyard and into my trailer then home. The colonies were heavy about 150 lbs each. Moving bees can be a disaster if it is not planned properly. I have moved hives in the past and have experienced disaster. Having improved my method, this move went flawless. All beekeepers that have put in new hives need to inspect for queen acceptance. By now there should be larvae and capped brood in many colonies. 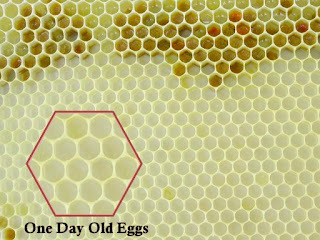 If it is hard to see the eggs, the larvae is there now and easy to tell if the colony is queen right. There is an emergency swarming strategy that is easy to do and works every time. Got through all the hives looking for uncapped swarm cells and remove them. 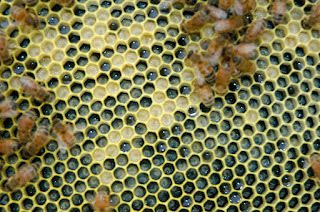 In the photo there is one hive that is over crowded and ready to swarm. Move this hive to where the weak hive is and the weak hive to the position where the strong hive is. Move the entire hive. What happens is the field bees fly out to forage, when they return, they come back to the hive where they think they were. Now the strong hive gets weaker and the weak hive gets much stronger. The strong hive still needs to have the over crowding issues resolved but, this will keep a swarm from happening. I have had several calls from new beekeepers looking at the dandelions and thinking they should stop feeding. If there is a hive on new foundation, the bees have to be fed syrup from the time they go in until around the third week of June or until the wax is all drawn out. If the syrup comes off too early the bees will not make wax, the population of the hive will not grow and the bees will not be able to overwinter. The warm humid weather of the last few days has kicked swarming into high gear. Beekeepers are being caught off guard by the timing of this swarming behavior. 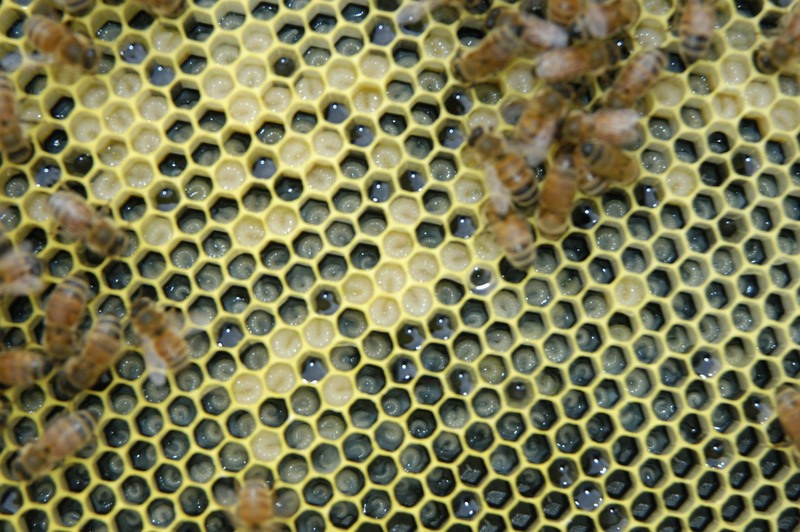 Swarming usually happens late May through June. The early spring build up has made colonies that were marginal going into winter, now they have huge populations bursting out of the hive bodies. Dividing is the only way out of this. Adding boxes will not stop swarming. Tips on slowing this down. Overwintered colonies should have the entrance reducer out, the slide out of the screened bottom board and honey supers on.